Moneycation: Why invest in multi-unit real estate? 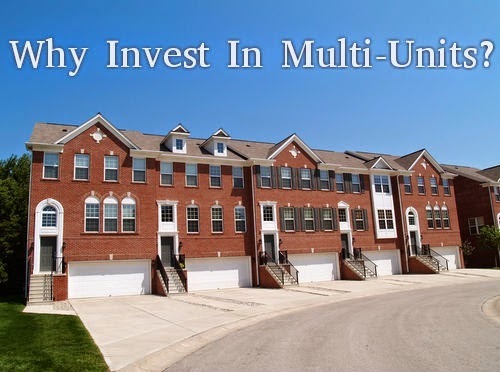 Why invest in multi-unit real estate? Lots of times, when looking for new real estate investments, people gloss right over the concept of multi-units. Many investors feel that multi-units are more for established investors or those with a big bank roll. Sometimes, it’s better to consider the concept over the actual numbers, because in reality investing in multi-units can bring a whole lot of benefits to your investment portfolio and your bank accounts. It’s a common thought process to think that buying a single-unit home makes the most sense when it comes to real estate investing. With a single unit dwelling, the situation seems like it would be more manageable and easy to navigate, but the ideal situation may be in multi-units. 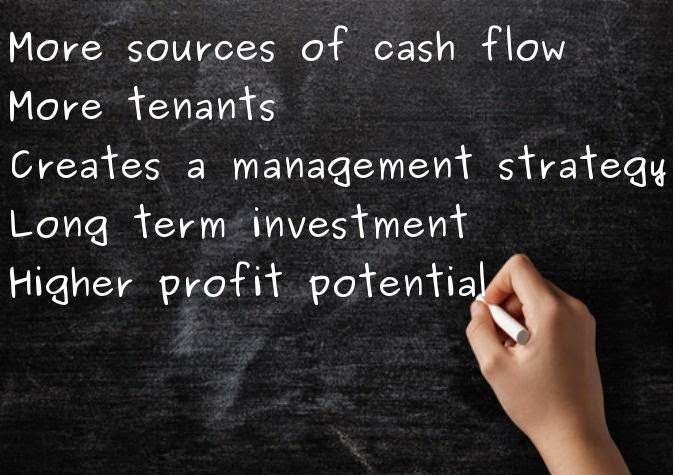 When you invest in multi-unit properties, you instantly have more sources of cash flow and obviously more tenants than with a single unit dwelling. With multiple streams of cash flow, expenses such as your mortgage on the property and regular maintenance can be covered with less of a challenge. If there are enough tenants paying enough for rent every month, an ideal situation may surface and you can use leftover income for re-investment in other areas. Investing in the right multi-units will also enable you to create a management strategy where the properties themselves are paying for professional companies to come in and manage the properties. It ends up being a big circle, because the type of property is what is enabling you to bring in the expert property management to have a high-quality, highly sought-after property. When you can create a buzz about living there, and a waiting list to get in, the profit will continue on well into the future. Many investors tend to think of investing in multi-unit buildings a hassle, but if you focus only on the investment part of it, you can see that this is something you can ride for years into the future. Not that buying a regular house and having one family live in it can’t be a solid long-term plan, but the “multiple” stream aspect of multi-units makes it awfully attractive. If you buy into multi-units with the thought of selling down the road, your profit potential is usually higher than if you focus on single unit dwellings. Owning multiple single-unit properties means that you have to manage and care for those investments at multiple locations. If you’re big into it, that could mean ten different locations. If you have ten units in a multi-unit property, everything happens at the one location. The same parts that seemed complicated at the start will simplify your role as time goes on and will put more money in your pocket. If you’ve been kicking around the multi-unit investment idea in the back of your mind, or even if you’ve purposely stayed away, check it out and see if it might be right for you. Almost every real estate coaching program I have attended they had advocated for multi units rather than single units. Also there’s nothing to lose by running numbers and asking questions, and potentially a lot to gain.